As if there isn’t already enough junk in space, an artist is planning to launch a reflective, inflatable sculpture to low Earth orbit in October. The art piece is meant to instil a sense of wonder and alter humanity’s impression of itself, but in reality it’s an empty gesture that’ll only serve to infuriate astronomers. It’s called the Orbital Reflector, and it’s the brainchild of U.S. artist Trevor Paglen. Once it’s unfurled and fully erect, the space-based sculpture will be visible in the night sky, appearing as a fast-moving bright star. Paglen’s installation will stay in low Earth orbit for a minimum of 60 days (though it could be longer), after which time it will, mercifully, re-enter the atmosphere and burn to a crisp. Unfortunately, it will be the second time this year that an artist has sent a reflective sculpture into space. Back in January, Rocket Lab CEO Peter Beck placed his three-foot-wide mirror ball, called Humanity Star, into orbit, attracting the ire of scientists, who complained that the bright object might interfere with astronomical observations. Sending twinkly, useless objects into orbit is apparently trendy now. As Jonathan McDowell, an astrophysicist at the Harvard-Smithsonian Center for Astrophysics, told Gizmodo earlier this year, “It’s the space equivalent of someone putting a neon advertising billboard right outside your bedroom window.” Indeed, Paglen’s Orbital Reflector, which is about the length of a football field, has the potential to be even more annoying than Beck’s disco ball, despite its potentially brief life. 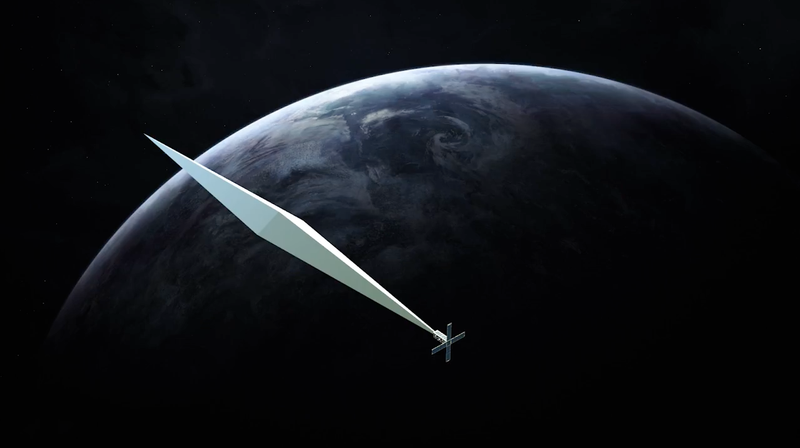 The diamond-shaped sculpture is made from a lightweight material similar to Mylar, and it’ll be packed inside a CubeSat. The satellite itself will be integrated into a low free flyer, a device that’ll be placed into a SpaceX Falcon 9 rocket. Once in low Earth orbit, the free flyers will dispense over 70 satellites at various intervals, including the CubeSat containing the collapsed sculpture. Following deployment, the sculpture should inflate into a large reflective balloon, orbiting the planet at a height of 350 miles (575 km) once every 90 minutes. Paglen has teamed up with the Nevada Museum of Art, Spaceflight Industries, and engineers from Global Western, a small, independent aerospace firm, to make this project happen. Launch of the Falcon 9 is expected in late October. For the project, Paglen and his colleagues had to secure the same levels of approval as required of any other CubeSat being transported to low Earth orbit, including getting a license from the U.S. Federal Communications Commission (FCC) and meeting regulations set out by International Traffic in Arms Regulations (ITAR). The group has also been in touch with the U.S. Air Force. Paglen says his sculpture will change the way we see ourselves, while reminding us of the many “invisible” satellites already in orbit. Ah, nothing like sending a non-functional satellite into an already crowded region of space to remind us of all the satellites already in low Earth orbit. Someone needs to tell Paglen that many satellites, including the ISS, are in fact visible to the naked eye; an extra dot in the night sky for several weeks will hardly transform humanity’s impression of itself. Amanda Horn, the director of communications for the Nevada Museum of Art, doesn’t see it that way. Horn says art is often subjective, “so any criticism for this project is not different from myriad critiques of other art projects.” That said, she says any potential disruption to astronomy will be minimal and temporary.